The eye is a unique sense organ in that it allows direct visualization of the retinal microcirculation and hence provides a window for detecting changes in microvasculature related to the development of various cardiovascular diseases such as arterial hypertension or coronary heart disease. Coarctation of the aorta (CoA) is either a congenital or an acquired vascular anomaly, wherein there is partial or complete stenosis of the artery near the insertion of ductus arteriosus. It leads to elevation of blood pressure above the site of obstruction and relative normal pressure below it. This elevated blood pressure probably gets transferred and is reflected in the retinal arterioles producing certain signs of hypertensive retinopathy. Fundus examination helps in differentiating hypertension due to CoA from other causes of juvenile hypertension, as corkscrewing of retinal arterioles is seen only in CoA but not in other conditions. We report a case of corkscrewing of retinal arterioles leading to diagnosis of CoA in a 16-year-old male patient. A 16-year-old hypertensive male presented to the ophthalmology outpatient department for routine checkup. The patient was on antihypertensive, atenolol 50 mg, once a day by the treating physician. His blood pressure in right arm in supine position was 110/70 mm Hg. On examination, his visual acuity was 6/6 in both eyes. Anterior segment examination of both eyes was unremarkable. Fundus examination of both eyes revealed a normal optic disc with generalized narrowing of arterioles and broadened light reflex. The arterioles showed corkscrew tortuosity (U-shaped arterioles). Veins were normal and did not show any tortuosity [Figure 1] and [Figure 2]. As the patient was asymptomatic and did not have any other fundal lesions other than tortuous areterioles, fundus flourescein angiography was not performed. 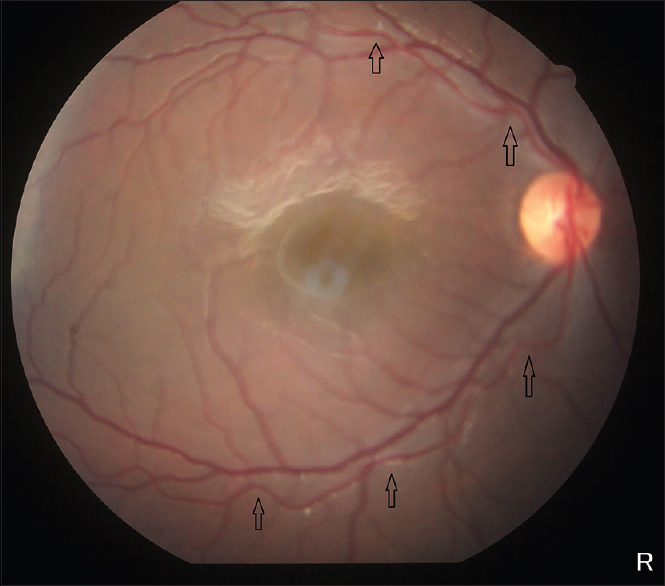 Based on fundus findings, CoA was suspected and the patient was referred for cardiac evaluation. Echocardiogram revealed post-ductal CoA and the patient was managed accordingly by the cardiologist. CoA is a cause of childhood hypertension. Tortuosity of the retinal vessels is usually seen in certain diseases, such as congenital heart disease, leukemia, polycythemia, and CoA. Granstrom in 1951 reported peculiar spiral tortuosity of retinal arterioles in CoA, introduced the term “corkscrew tortuosity,” and observed the finding in 60% of patients with CoA. Schwartz et al. reported five cases of CoA, wherein tortuosity and sclerosis of retinal arterioles were present in four cases. Tortousity of retinal arteries has been reported in 70% of patients with CoA. Usually, in other causes of juvenile hypertension, both arterioles and veins are affected to a comparable degree, whereas in cases of CoA, the tortuosity is confined largely to the arterioles. In CoA, tortuosity of arteries in the form of corkscrew is common in upper half of body, becoming more prominent with age. Furthermore, the tortuosity in CoA has a peculiar spiral or “corkscrew” appearance which is quite distinct. The bends in the vessels in the usual types of tortuosity tend to be from side to side and fairly well localized to one plane. Friedenwald analyzed the various factors responsible to produce tortuosity and pulsation in the retinal arterioles. Pliable vessels, a high systolic blood pressure, a relatively wide pulse pressure, and reduced peripheral resistance undoubtedly are important factors which tend to produce tortuosity in coarctation and these factors become more pronounced with increasing duration of the disease. The retinal vascular abnormalities in CoA result due to secondary hemodynamic changes. Examination of retinal arteries reveals the status of systemic arteries as well. In cases of hypertension due to other causes, retinal arterioles are attenuated but not tortuous and there will be presence of additional findings such as hemorrhages, cotton wool spots, and disc edema in cases of malignant hypertension. As this patient was of young age and had corkscrewing of retinal arterioles, without other retinal changes usually present in hypertensive disorders of a different nature, CoA was suspected and hence was referred for cardiac evaluation which revealed CoA. This highlights the importance of funduscopy in helping in diagnosing systemic conditions. An account of the characteristic retinal changes which consisted of corkscrew-shaped tortuosity of the retinal arteries in a case of CoA is made. It is therefore suggested that in juvenile hypertension, careful examination of the fundus can provide a clue to systemic diagnosis. 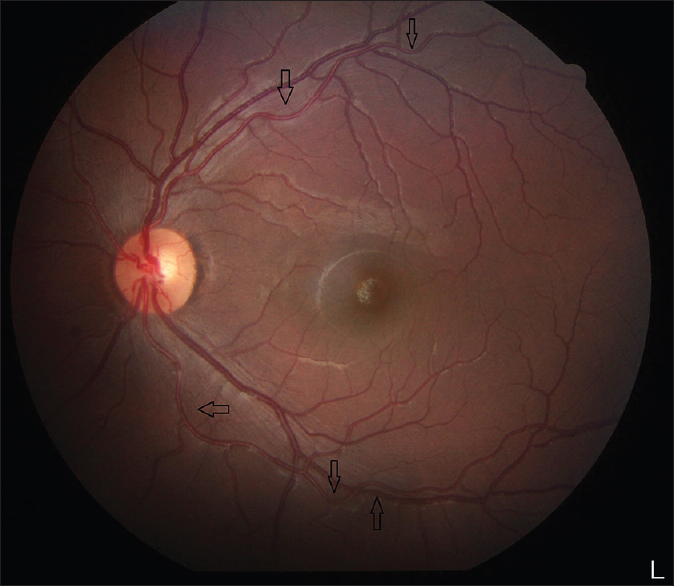 This case highlights the importance of ophthalmoscopic examination in diagnosing a potentially fatal systemic disease. Liew G, Wang JJ. Retinal vascular signs: A window to the heart? Rev Esp Cardiol 2011;64:515-21. Granstrom KO. Retinal changes in coarctation of the aorta. Br J Ophthalmol 1951;35:143-8. Raczyńska K, Potaz P, Aleszewicz-Baranowska J. Epidemiology of hypertensive retinopathy in young patients after coarctation of the aorta repair. Klin Oczna 2004;106:456-9. Schwartz R. Coarctation of the aorta. N Y State J Med 1916;16:739. Shamsa K, Perloff JK, Lee E, Wirthlin RS, Tsui I, Schwartz SD, et al. Retinal vascular patterns after operative repair of aortic isthmic coarctation. Am J Cardiol 2010;105:408-10. Friedenwald JS. Retinal vascular dynamics. Ain J Ophthalmol 1934;17:387. Johns KJ, Johns JA, Feman SS. Retinal vascular abnormalities in patients with coarctation of the aorta. Arch Ophthalmol 1991;109:1266-8.